For the third year in a row Topo Centras in Vilnius has been organizing the most innovative annual Tech Top 2017 awards – the only awards in Lithuania that applauses are not for people, but for technical. TVs, phones, computers, home appliances, the most innovative technicals of the year and many other categories of equipment are selected and rewarded during the event. This year’s National Technical Awards were not just about technological progress, but also about the human relationship with technology. The two hosts of the event, acquainted the guests with the latest technological advancements. 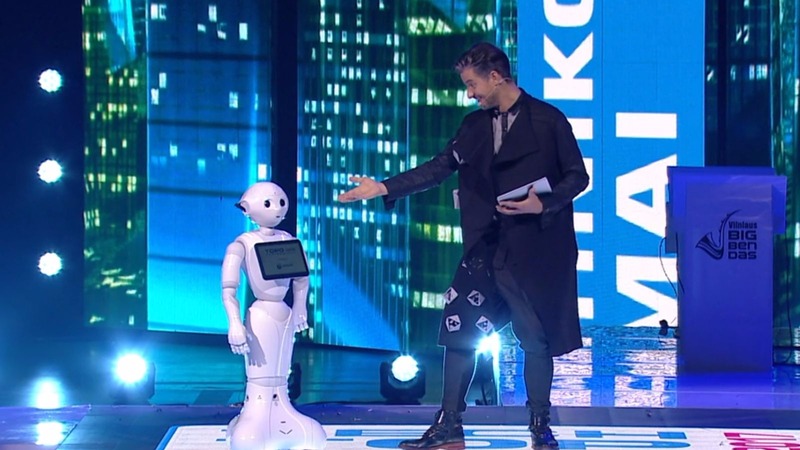 During the show, the hosts changed each other on the stage with innovative equipment and one of the innovative solutions on the stage was the humanoid robot Pepper. Ellore created the software application that made it possible that Pepper could be one of the hosts of the event. During the show the humanoid robot Pepper surprised all the viewers that he had great leadership abilities, unrivaled sense of humor and even the ability to flirt. Automation, robotics, artificial intelligence, self-propelled machines – these are words that we hear more and more often over the world. It’s obvious that the world is changing, and the future in the next 15-20 years will probably look different than today – you will wake up and the robot will have prepared breakfast for you and read the main news headlines, including daily weather forecasts, and this might not be such a distant future. And here’s the leading robot company Softbank Robotics has created a humanoid robot named Pepper, designed to communicate with people and recognize their emotions in response to the language. This is the first mass-produced humanoid robot in the world.